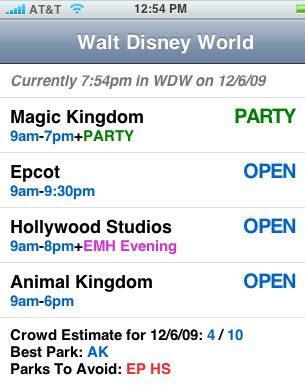 Lines now knows about hard ticket events–just in time for tonight’s Mickey’s Very Merry Christmas Party! This means that MVMCP will be added to the parks status page (see image), and that we’ll keep the park “open” during the parties to provide wait time estimates! And don’t worry, Lines knows which attractions are open. For you planners, we also recently updated our Mickey’s Very Merry Christmas Party Touring Plans. So if you’re planning on heading to one of Mickey’s Very Merry Christmas Parties this season (perhaps with the WDW Today reunion? ), bring Lines along with you! We’d especially love to get some posted wait times submitted from the parks during the party. Lines now supports iPhone, Android and Palm, and most recently, BlackBerry! All your Disney World wait time needs, from the comfort of your smartphone! Check it out at http://m.touringplans.com. This is so cool! Wish I could be there to try it out. So ready to try it out next week! We’re at MVMCP on Thursday. I’m so ready to try it out at all the parks! Awesome, thanks Janet! Would really like some data from MVMCP–hope you have a great time! I have a question. I know I can send you posted wait times from the parks, but why not actual wait times with a distinction between regular and FP return lines? Just curious why you do not want to collect that information as well. Excellent question! The biggest issue is that collecting how long you actually waited in line is kind of tricky. It’s also open to a lot of interpretation–when do you “start” the timing? When do you stop? Also, at least when I do this, it’s really easy to forget to stop or start the time and be off by a few minutes. And then when you actually report in, you’d have to list the time you got in line and the time you got on the ride, which is a bit more work as well. Submitting the posted times is just so much easier–you’re standing in front of an attraction, and you mark down what it says. And it turns out that we can predict how long you’ll actually wait in line pretty well using this data. I can’t get the MVMCP lines to work on my Blackberry. It works on my desktop but not BB. Just testing before I go next week. Everything else works great. Thanks for the find! Just fixed it. Let me know if it looks better for ya. Yes all is well now, thanks. Henry, sorry to come late to the party, but I wanted to ask – why was AK listed in your mockup as open if it closed at 6pm and the time was 7:54? Hah, I need to replace that! That was a bug that never left my development machine. Nice catch!